It worked! Making an order deadline (and subsequently enforcing it) has created a distinct lack of stress this year, for the first time since I started my business in 2004. I finally get to enjoy December, hang out with my family and friends at will, and not get burnt out doing custom orders at the last minute. We figured we won’t bother getting a Christmas tree until Olivia “gets” it (and wouldn’t want to eat it), though. 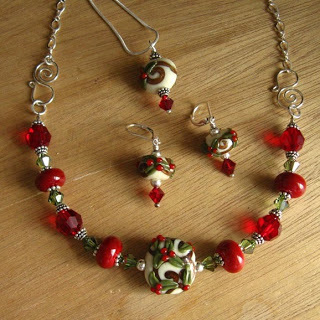 The thing I love about these Christmas lampwork beads is the gold swirls and holly that resemble Lenox china with a subtle nod to the holiday. I’m not into cutesy reindeer or snowmen lampwork beads. The necklace is actually a bracelet with an extender that hooks into the other end. You can wear it as either, depending on your outfit or taste.